How to make the most of the precious few moments you get to yourself. Tabata For 20 seconds you’ll fry one set of muscles, then enjoy the sweet relief of a ten-second break. Repeat eight times and you’re rewarded with a one-minute rest. The sequence continues with various moves for a sweat-dripping, muscle-quivering, heart-pumping half hour that’ll work off 350 calories. Mondays at 5pm and 5:45pm at Equinox Lincoln Park (1750 N Clark St, 312-254-4000). $25 for a day pass. Flywheel This is spin on steroids: Burn 500–700 calories seriously sweating it out on customized bikes that allow you to track resistance and revolutions per minute, and race other riders by following everyone’s numbers on leader boards. (You can hide your stats if you like, but what fun is that? Smoke those slowpokes.) The New York–based chain has a loyal following for its hard-core attitude and upscale service: Classes include clip-in shoes, cushiony saddle pads, towels and unlimited bottled water (you’ll need it). Morning, lunchtime and evening classes offered seven days a week at Flywheel Sports (710 N State St, 312-624-8485). $25. 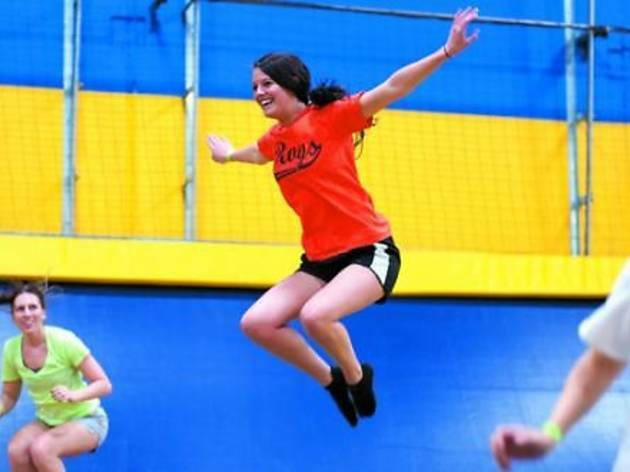 AIRobics Grown-ups take over the main trampoline court five times a week at this kid-centric sports and party chain to work off up to 1,000 calories bouncing around like no one’s business. Instructors lead you through choreographed sets of jumping jacks, leap frogs and other moves; a square grid overlay prevents you from bouncing into your neighbor’s space, but it’s tricky to stay standing (and serious) when you have to jump between the squares. 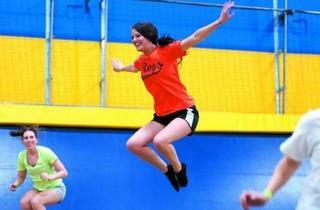 During evening classes, your kids can play on the other tramps while you bust a move. Tuesdays and Thursdays at 6, 7pm; Saturdays at 9am at Sky High Sports (6424 Howard St, Niles; 847-801-5867 or 2244 Corporate Ln, Naperville, 630-717-5867). $8.